Hundreds of Open Days are taking place throughout the country! 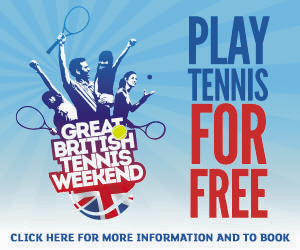 Dumfries Tennis Club will be taking part in the Great British Tennis Weekends on the 28th-29th June & 19th-20th July. They are offering free tennis and coaching for people of all ages and abilities. It’s the perfect day out for family and friends. Click in the link below to book your space.